The Universe we see around us has some unusual properties. In every direction we see roughly the same number of galaxies on large scales. The cosmic microwave background has roughly the same temperature in all directions, and the Universe as a whole is topologically flat. In physics terms this means the Universe is homogeneous and isotropic. But according to the big bang model, we wouldn’t expect that to be the case. One way to solve this issue is through a process known as inflation, but this raises some interesting problems of its own. The observational evidence for the big bang is quite strong, so we know the early Universe was extremely hot and dense. We also know the Universe is expanding at an ever increasing rate due to dark energy. But if cosmic expansion is only driven by dark energy, then it would seem the Universe is too homogeneous and isotropic. There simply wasn’t enough time for the Universe to reach a homogeneous state before things started collapsing under gravity. However, if the Universe had a period of very rapid expansion (known as the inflationary period), any major fluctuations in density and temperature would be smoothed out, and the Universe we observe would be a small fraction of the cosmos. The inflation model was first proposed by Alan Guth in the 1980s, but to understand the model we need a bit of quantum theory. 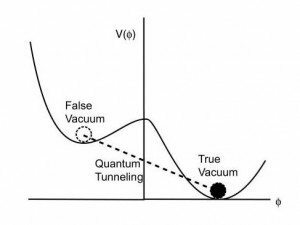 A false vacuum is a local energy minimum, but not the true minimum. Physical systems tend to move toward a state of lowest energy. For example, a hot object will tend to cool down by emitting heat and light. The Universe is no exception, and so it’s tendency should be to expand and cool. A system will move toward the lowest energy if it can, but sometimes a system might reach a low energy state that isn’t the lowest possible energy. For example, a ball will tend to roll down a hill, but it might find itself in a shallow dip in the side of a hill. The dip is a local minimum, but the bottom of the hill is the true minimum. For an object like a ball, once it reaches a local minimum it is stuck there. The ball can’t climb out of the dip to keep rolling downhill. But quantum systems can shift out of a local minimum. Through a process known as quantum tunneling, they have a small probability of jumping the gap to reach lower energy. Since the Universe is fundamentally a quantum system, the early Universe could have found itself in a local minimum, or what’s known as a false vacuum (since a vacuum would be the lowest state for the cosmos). It would stay in this false vacuum for a time before quantum tunneling to the true vacuum. What Guth found was that since the false vacuum state has energy, it could cause the Universe to undergo rapid expansion. Under the inflationary model, the early Universe was in such a false vacuum for a brief period, and thus had a brief period of inflation. The inflation model is actually pretty elegant, and since the model solves these kinds of problems so well, it is generally thought to be the correct solution. 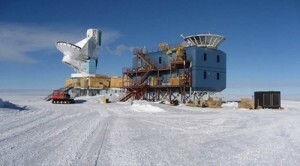 Most astrophysicists figure it is just a matter of gathering enough data to detect its effects. There are, however, some issues with inflation. One of the big ones is that there are lots of ways inflation could occur, and most of them wouldn’t lead to the type of Universe we observe. They might inflate so much that stars and galaxies never have a chance to form, or not enough to give us a homogeneous universe. There a very narrow range of inflation that would produce a universe like ours, and it seems odd that inflation would just so happen to occur that way. This problem is part of the larger issue of the anthropic principle, where some argue the Universe seems to be configured in just the right way for life to exist. Eternal inflation would create countless pocket universes. But a variation of the inflation model may solve the issue. Known as eternal inflation, it argues that the Universe might not collapse from a false vacuum as a single whole. Instead, different parts of the Universe might reach different false vacuums, and they might drop out of that false vacuum at different times. While our region of the Universe seemed to drop out rather quickly, other parts would have dropped out later, and still other parts might still be inflating. This model leads to a kind of multiverse, where there are pockets on non-inflationary universes surrounded by regions that are still inflating. As a result, all the different varieties of inflation would occur. Under eternal inflation, a universe such as ours is bound to occur. Of course all of this is pretty speculative. 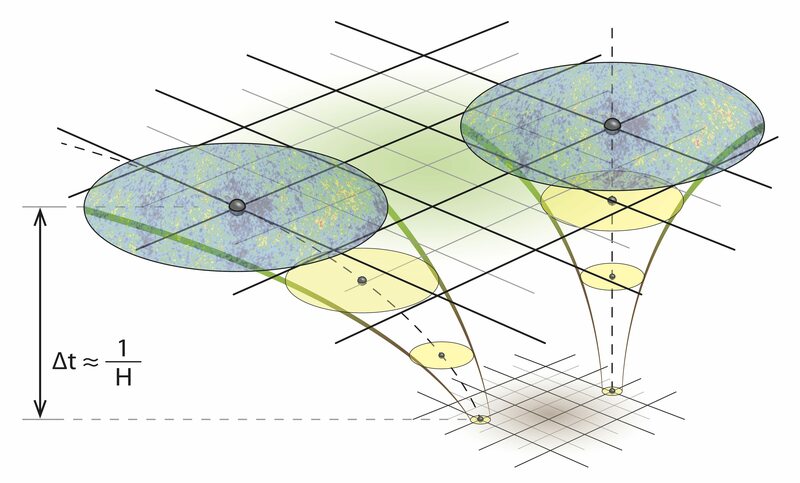 Since we don’t have any way to observe the multiverse, we’d need to understand just how eternal inflation could arise. Right now we don’t even have any direct evidence for inflation, and until we have evidence we can’t narrow down the nature of inflation (assuming it occurred). So for now we’ll just have to keep gathering evidence. What about deflation? Is the universe only expanding? I found a video yesterday on youtube which is an interview with Richard Feynman and they ask him things such as “why do magnets work” and I feel this ghostly vibration that what he is saying with forces repelling and attracting is very much related to quantiuum tunneling and the nature of the expanding universe. But to me since things in the universe can be obsereved deflating (such as a balloon) then maybe it isn’t just strictly expanding.